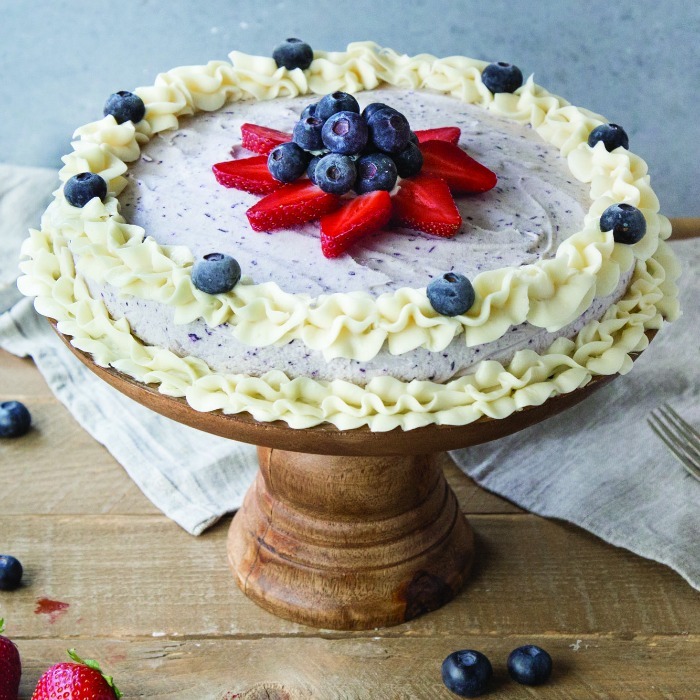 Cool off your friends when the temperature is rising with this scrumptious Blueberry Vanilla Ice Cream Cake Recipe with cream cheese frosting. 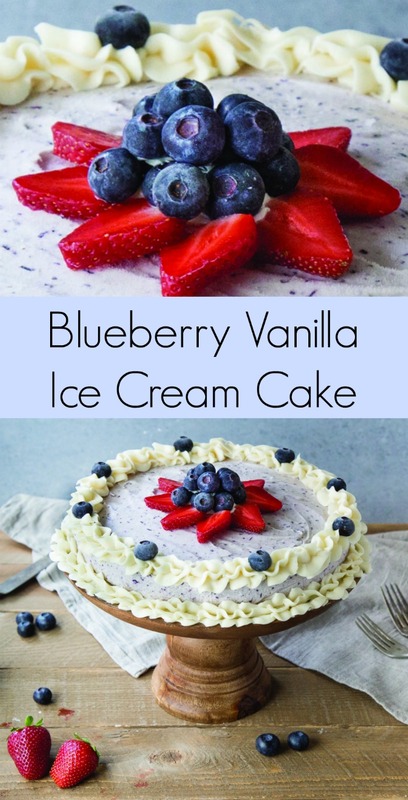 This Blueberry Vanilla Ice Cream Cake with Cream Cheese Frosting uses a puree of fresh blueberries for a base that is topped with rich cream cheese frosting. Strawberries add a touch of color to this festive summer treat. Nothing pairs with a spectacular fireworks show quite like a delicious, festive dessert you can make yourself. The Curious Creamery’s Ice Cream Cake Mix provides a simple way to make a delicious and impressive dessert for your Fourth of July party – no ice cream machine required. You can find more sweet and healthier dessert recipes at TheCuriousCreamery.com. Note: You can find The Curious Creamery’s Ice Cream Cake Mix at these locations. But the mix should be available via Amazon and Walmart soon. Find more summer dinner dishes on Mommy Evolution! Yummy and beautiful! My 4th is taken care of now! Pinned. This ice cream cake looks amazing and so refreshing! What a perfect treat to service for 4th of July. Thank you for sharing on Family Joy Blog Link-Up Party. Have a great week! Beautiful cake – and perfect for the 4th of July party! Thanks for sharing on the What’s for Dinner Link up! This is such a beautiful cake. It looks super yummy too! Nom! This looks and sounds so good… and so refreshing! IT’s very interesting in how the cake is made – It is just beautiful, too! Thanks for sharing with us on Throwback Thursday!